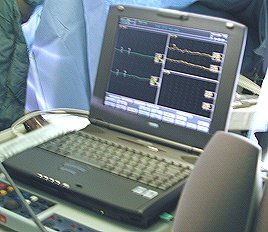 Intraoperative monitoring (IOM) measures small electrical signals produced within the nervous system. These small signals can be on-going such as those measured in an EEG or "evoked" responses produced by stimulating the nervous system, similar to a reflex. In the hands of experienced technologists or physiologists, IOM can reduce the incidence of permanent neurological deficits following neurosurgical procedures such as microvascular decompression surgery. IOM can detect subtle changes in nervous system function and can provide an early warning to the surgical team so that permanent damage is avoided. This information can guide the surgical team to modify the procedure in order to improve outcome and reduce the risk of surgery. 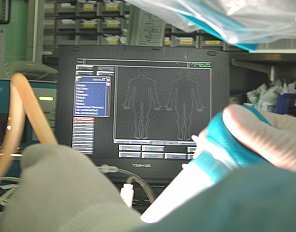 In MVD surgery, IOM personnel place recording electrodes, similar to EKG electrodes, on the patient and connect these to a computerized workstation that records and displays the results of the neurologic tests. Specifically, we measure the Brainstem Auditory Evoked Response for the continuous assessment of the cochlear (hearing) nerve. This nerve is very sensitive to stretch or manipulation which may result in hearing loss postoperatively. Monitoring of cochlear nerve function alerts the surgical team to potentially injurious situations and allows them to make adjustments in order to avoid permanent hearing loss. In addition to monitoring hearing during MVD surgery, we also examine other cranial nerves such as the facial nerve. For hemifacial spasm we can continuously observe the abnormal muscle activity in the facial muscles. This not only alerts the surgical team of any threat to the facial nerve's function, but can also indicate when the surgical procedure has relieved the cause of the facial spasm. Several other cranial nerves are monitored during some operations. Also, additional neurological systems and function may be assessed with somatosensory evoked potentials (SSEPs) and motor evoked potentials (MEPs). While not all the IOM techniques are necessary for every surgery, their routine use for specific operations is advocated by many surgical teams including ours. © 2001 Centre for Cranial Nerve Disorders, Winnipeg, University of Manitoba, Health Sciences Centre. The information provided on this web-site is intended for educational purposes only, and should not be used to diagnose or treat a disease or disorder. This information is not intended to substitute, supplement, or in any way qualify the services or advice provided by a qualified health care professional. Please consult with a certified health care professional before pursuing any form of medical action. Duplication in any part or form of this document is strictly prohibited. All rights reserved. For further information please read our disclaimer. Inquiries can be directed to the Information Provider of this web-site.